Stem cells, those prodigious precursors of all the tissues in our body, can make almost anything, given the right circumstances, but unfortunately that can also cause cancer sometimes. However research from Rockefeller University has shown that having too many stem cells, or stem cells that live too long, can increase the odds of developing cancer. By identifying a mechanism that regulates programmed cell death in precursor cells for blood, or the stem cells that make all blood-based cells (hematopoietic stem cells), these researchers have connected the death of such cells to a later susceptibility to develop tumors in mice. This work also provides evidence of the potentially carcinogenic downside to stem cell treatments, and suggests that there is a balance between stem cells’ regenerative power and their potentially lethality. Research associate Maria Garcia-Fernandez and head of the Strang Laboratory of Apoptosis and Cancer Biology, Hermann Steller, and colleagues explored the activity of a gene called Sept4. Sept4 encodes a protein called ARTS that increases programmed cell death, or apoptosis, by antagonizing other proteins that prevent cell death. ARTS was originally discovered by Sarit Larisch while visiting Rockefeller, and is lacking in human leukemia and other cancers, which suggests that it suppresses tumors. To study the role of ARTS, the experimenters bred a line of mice genetically engineered to lack the Sept4 gene. ARTS interferes with molecules called inhibitor of apoptosis proteins (IAPs), which prevent cells from undergoing programmed cell death. When cells accumulate too much damage to work properly, programmed cell death ensues, and the damaged cell is replaced by a new cell. Programmed cell death is also called “apoptosis.” By inhibiting these IAPs, under the right circumstances ARTS helps to take the brakes off the process of apoptosis that normally permits the cell to die on schedule. Pharmaceutical companies are working to develop small molecule IAP antagonists, but this research is the first to show that inactivating a natural IAP antagonist actually causes tumors to grow, according to Steller. It also suggests that premature silencing of the Sept4/ARTS pathway at the stem cell level may herald cancer to come. Research groups from Okayama University Graduate School of Medicine have made remarkable breakthroughs in liver transplantation. One team found that mouse induced pluripotent stem cells can form liver cells. The second group showed that transplantation of liver cells from another animal species could reverse the symptoms of liver failure in mice. The first research team use mouse induced pluripotent stem cells (iPSCs) and subjected them to a protocol to convert them into liver cells. They cultured the iPSCs in free-floating cultures to form embryoid bodies. Embryoid bodies (EBs) are cell aggregates derived from embryonic stem cells when they are grown in non-attached, free floating cultures, like a hanging drop. EBs can also be induced by plating embryonic stem cells (ESCs) on non-tissue culture treated plates or by growing them in spinner flasks. Once the cells aggregate, they differentiate to a limited extent to roughly recapitulate embryonic development. EBs are composed of a large variety of differentiated cell types. However, EB differentiation is largely disorganized. The EBs were then treated with a growth factor called “fibroblast growth factor” and activin for three days to induce the formation of endodermal tissues. On the eighth day of differentiation, they treated the cells with “hepatic growth factor” for eight days. After 16 days, they had functional liver cells, and this protocol seemed to work quite well. A variety of genetic and metabolic tests showed that these cells were liver cells. They expressed liver-specific enzymes like urea cycle enzymes, the iron transport protein transferrin, asialoglycoprotein receptor (ASGR), and the all-important liver-specific protein, albumin. Metabolically, the iPSC-made liver cells also metabolized ammonium, which is a liver-specific activity. A major limitation for cell-based therapies for the treatment of liver diseases is the shortage of livers for transplantation, and the risk of rejection by the immune system if the transplanted tissue is not well matched with that of the donor is also a stark problem. This technology, however, provides the means to make transplantable liver cells from someone else’s own somatic cells. The second study used pig liver cells for mice with failed livers. Because of the lack of suitable livers for transplantation, Naoya Kobayashi argued that the greater supply of pig liver cells suggest that once technical issues are overcome, pig liver cells might be transplanted successfully into human livers. In their recent study, Kobayashi and colleagues successfully transplanted pig liver cells into mice with acute liver failure. Their transplantations caused the mice with liver failure to survive and their symptoms subsided. Kobayashi provided this statement: “Using xenogenic hepatocytes from animals such as pigs might be advantageous for treating acute liver failure in humans…. Hepatocytes are the main active cells in the liver. However, removal from the liver causes hepatocytes major stress and potential loss of function. We tested a scaffold to improve the success of hepatocyte xenotransplantation…. In this xenotransplantation model, we found that the SAPNF has an excellent ability to promote hepatocyte engraftment and maintains tremendous hepatocyte functions capable of rescuing mice from acute liver failure. Dr. Kobayashi collaborated with colleagues from the Baylor (Texas) University Institution for Immunology Research. On October 11, 2010, Geron Corporation announced that they had announced the enrollment of the first person in the company’s Phase I clinical trial of their human embryonic stem cell (hESC)-derived oligodendrocyte progenitor cell, GRNOPC1 for treating spinal cord injuries. Because this is a Phase I study, its primary objective is to determine the safety and tolerability of this cell line in patients with complete American Spinal Injury Association (ASIA) Impairment Scale grade A thoracic spinal cord injuries. According the Geron Corporation, patients in the study must be newly injured and receive GRNOPC1 within 14 days of the injury. Geron enrolled their first patient at the Shepherd Center, which is a 132-bed spinal cord and brain injury rehabilitation hospital and clinical research center in Atlanta, GA. This is not the only center that can enroll patients in this clinical trial. The disappointing aspect of the media coverage of this event is the huge excitement over the “what might be” potential of embryonic stem cell- (ESC) derived treatments for spinal cord injuries even though real treatments are alive and well that use non-ESC resources. Even in patients fifteen years after their spinal cord injury have been helped by somatic stem cell treatments. Laura Dominguez is one such patient. She can now walk with braces even though her spinal cord injury rendered her completely unable to walk. The second issue is the fact that there is a real risk of tumor formation. To be fair, these differentiated derivatives of ESCs do not consistently cause tumors in laboratory animals, but there is no guarantee that their tumor-causing capacity has been completely abolished. Hans Keirstead at UC Irvine, who did the groundwork on the ESC-derived cell line, did not see tumor formation when he transplanted these cells into rats. Geron scientists have also not reported tumor formation in their experiments. However, tumor formation is still a concern, and the fact that Geron has pledged to observe these patients for 15 years after the procedure testifies to this risk. Finally, work by Geron scientists have established that these ESC-derived cells do not work if they are implanted one-two weeks after the injury. Why are we putting so much money into something that has such distinct limitations? The largest concern is the fact that these ESC-derived cells are made by destroying human embryos. We were all embryos at one time. If I were to show you a picture of myself at the eight-cell stage, you would have made the connection between me as an embryo and me as an adult. The only difference is that the embryo is smaller, less mature, located in my mother’s uterus, and more dependent than I am now. None of these differences are essential differences between who I am now and who I was then. We do not exile people from humanity because they are too small, too dependent on someone else, located in a place we do not like, or who are immature. These are accidental differences and not essential differences. To destroy these embryos at this young stage is to kill a very young human being simply because we can. It is a simple case of the strong exerting their will over the weak in a way that ends the life of the weak. It is simple murder. This is too great a price to pay for cures. We can do better. A study by Professor Jonas Frisén and his research group at Karolinska Institutet, Sweden, and collaborators from France and Japan shows how stem cells and several other cell types contribute to the formation of new spinal cord cells in mice and how this changes dramatically after trauma. They identified a type of stem cell, called an ependymal cell, in the spinal cord. They further demonstrated that these cells are inactive in the healthy spinal cord. However, once the spinal cord is injured, ependymal stem cells are activated to divide and become the dominant source of new cells. These stem cells produce cells that form scar tissue and differentiate into a type of support cell that is an important component of spinal cord functionality. The scientists also show that a certain family of mature cells known as astrocytes produce large numbers of scar-forming cells after injury. There is hope that stem cells might treat damaged spinal cords at some time in the future. Internal stem cells in the spinal cord, however, tend to produce cells that manufacture the glial scar that prevents the immune system from entering the spinal cord and destroying it. However, the glial scar also prevents the regeneration of spinal nerves. The scar is surrounded by molecules called heparan sulfate proteoglycans, which repels nerve cell axons. Therefore, internal stem cells contribute positively to the early stages of the injured spinal cord, but seem to contribute negatively to the lot of the injured spine in the later stages. There is hope that damage to the spinal cord and brain will one day be treatable using stem cells. However we need to deal with the toxic waste dump that is the damaged spine before you put stem cells into the damaged spinal cord. In an on-line publication of the New England Journal of Medicine on June 23, 2010, Paolo Rama and colleagues described a study in which patients who were blind because of “corneal burns,” or burns to the outer surface of the eye, were given back their sight. The technique they used to restore sight to these patients was stem cell transplants. The transparent covering of the eye, which is call the cornea, transmits light through the surface of the eye to the lens. The cornea contains no blood vessels, and this keeps it clear and transparent. Because the cornea contains no blood vessels, corneal cells are constantly replaced by a stem cell population called limbal stem cells lie at the border between the cornea and the whites of the eye, which is known as the “conjunctiva.” These limbal stem cells divide and spread throughout the cornea until they are sloughed from the cornea by blinking or tear action, only to be replaced by limbal stem cells. If the cornea is burned by chemicals, sparks, or other insults, damage to the limbus can prevent it from constantly regenerating the cornea. Such burns can cause the cornea to cloud and induce the formation of blood vessels in the cornea. This makes the cornea opaque and prevents it from transmitting light to the lens. Several papers have shown that transplanting limbal stem cells can rejuvenate the corneal limbus and the cornea too. However, if the cornea and its limbus is damaged, then where can the clinician go for limbal stem cells? Some papers have describes the use of corneal limbal stem cells from cadavers. These so-called allogeneic limbal stem cell transplants have problems. Finding enough limbal stem cells to transplant is the first problem and the inability of these stem cells transplants to properly integrate into the eyes of the patients are just two of the major ones. Other researchers have tried taking limbal stem cells from the undamaged eye and transplanting them into the damaged eye. While this technique, which is called autogenous limbal stem cell transplants, have a better success rate than the allogeneic limbal stem cells transplants, damaging the good eye to help the blind eye is problematic. How could physicians get around this problem? The best answer for now seems to be culturing limbal stem cells from patient’s own eyes and growing them in the lab. This provides large quantities of limbal stem cells for transplantations. In this New England Journal of Medicine article, dozens of people blinded or injured by chemical burns had their sight restored by transplants of stem cells from their own eyes. 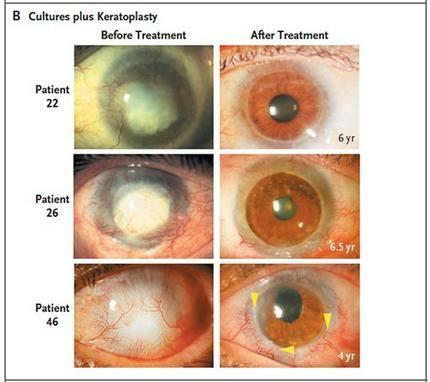 The limbal stem cells were grown on fibrin and used in transplantations to heal the opaque corneas of these patients. This is another victory for somatic stem cell treatments. University of Colorado Cancer Center researcher Chuan-Yuan Li, and his co-workers have discovered that caspase genes are the gatekeepers that can open the door to allow differentiated adult cells to regress to undifferentiated iPSCs. Caspase genes encode protein-degradation genes that initiate programmed cell death. Programmed cell death is an essential process in development, and in the maintenance of tissues, blood cells, and other physiological processes where cells must die and be replaced by other newly minted cells. Li and his colleagues found that if they treated fully differentiated cells with chemicals that inhibit caspase and then treated them with genes that can cause them to become induced pluripotent stem cells (iPSCs), the fully differentiated cells refused to become iPSCs, even thought they were expressing the genes that normally drive cells to become iPSCs. These experiments show that caspases are essential for the iPSC transformation. They do not drive the transformation, since Li and his co-workers tried placing extra caspase genes into cells without any iPSC transformation. Nevertheless, Li’s work shows that without functional caspase, iPSC formation does not occur, which makes it one of the central elements in iPSC formation. Li stated that caspases seem to loosen up the built-in controls that make a cell differentiated or undifferentiated, just like a clutch allows a driver to switch gears while driving. Undifferentiated stem-like cells and differentiated cells from one person have the exact same genes. The difference between them is which genes are turned on or off. Caspases, therefore, could be the key to taking a cell and changing it back to its original state to become any kind of cell. University of Buffalo researchers have engineered adult stem cells that grow continuously in culture. This discovery could aid in the development of cost-effective treatments for diseases including heart disease, diabetes, immune disorders and neurodegenerative diseases. The University of Buffalo researchers called these new cell lines “MSC Universal.” They made them by genetically engineering mesenchymal stem cells, which are found in bone marrow and many other tissues, and can be transformed into bone, cartilage, fat, beta-pancreatic islet cells, and other cell types as well. This breakthrough might overcome a significant hurdle to progress in the field of regenerative medicine – the difficulty of growing adult stem cells for clinical applications. Mesenchymal stem cells have a limited life span in laboratory cultures. Therefore, scientists and clinicians who use such cells in their research and treatments must continuously obtain fresh samples from bone marrow donors. This process is expensive and time-consuming, and mesenchymal stem cells from various donors can vary wildly in their performance. The cells modified by University of Buffalo researchers show no signs of aging in culture. Besides that, they appear to have the same characteristics as regular mesenchymal stem cells, and that includes their ability to confer therapeutic benefits to animals that have heart disease. Despite their propensity to proliferate in the laboratory, the MSC-Universal cells do not form tumors in animal tests. Techung Lee, leader of the project and associate professor of biochemistry and biomedical engineering in the School of Medicine and Biomedical Sciences and the School of Engineering and Applied Sciences at the University of Buffalo said: “Our stem cell research is application-driven.” Lee continued: “If you want to make stem cell therapies feasible, affordable and reproducible, we know you have to overcome a few hurdles. Part of the problem in our health care industry is that you have a treatment, but it often costs too much. In the case of stem cell treatments, isolating stem cells is very expensive. The cells we have engineered grow continuously in the laboratory, which brings down the price of treatments.” The university has also applied for a patent for Lee’s discovery.